We present to you a collection of NBP plug-ins for Adobe Photoshop, developed by Nino Batista and his team, to bring retouching to the next level of control, consistency, ease of use and generally the best results. These panels are not just actions that trigger existing Photoshop tools, but all of the new algorithms and functions with intuitive user interfaces that revolutionize your retouching workflow, make it easier to explore more creative options and help you get the results you want. NBP Freqsep Control- The evolution of frequency separation for retouching. Maximum texture consistency with the smoothest results, all with absolute control. 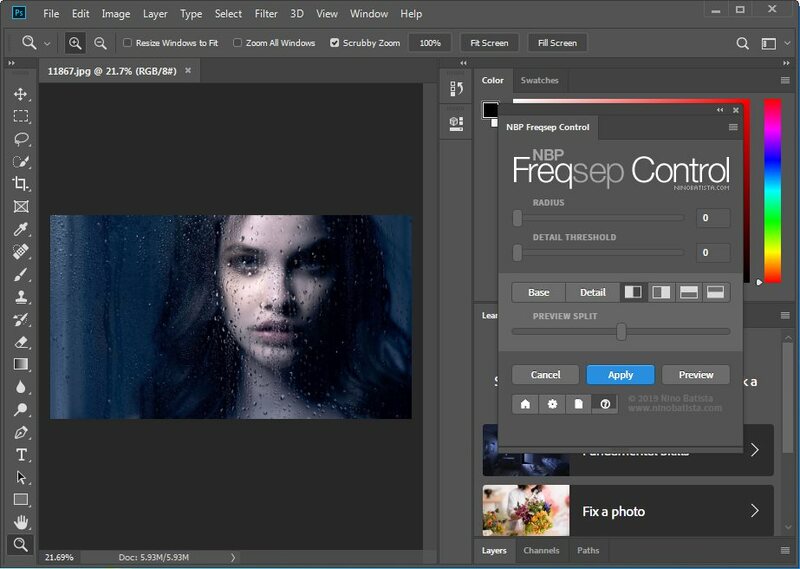 • Select Radius (blur / anti-aliasing) and Detail Threshold (edge ​​preservation) to customize it for your preferred view, image resolution and workflow in an intuitive and efficient user interface right in Photoshop as the Extensions panel. • Allows you to preview the base (low frequency) and detailed (high frequency) results in split mode or separately before use to make sure that you get the desired results.